Businesses Giving Back: Balloons Unlimited — Lodi Live! All photos courtesy of Balloons Unlimited. See more balloon art via their Facebook or Instagram. Kathy received an international award for her creativity with this fun piece. 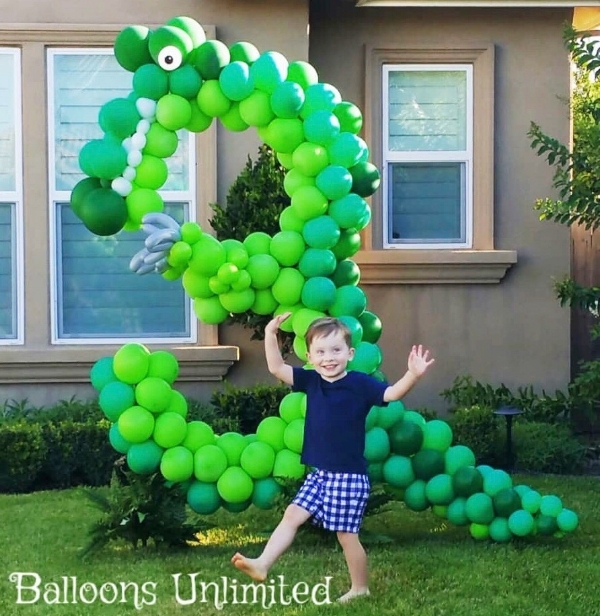 The cutest dinosaur balloon 3 you ever did see! There’s a lot of great things about shopping locally. One of the best things about it is that the money stays in the community. It’s not just that local business owners spend more money within the community, it’s also that local business owners tend to give back more to the communities they’re part of. The next time you go to an event in Lodi, notice how many sponsors are local businesses. Local businesses are invested in our community and that’s why this section is dedicated to recognizing the local businesses that give back to our Lodi community. Kathy Cassebarth Is the owner of Balloons Unlimited. I came to know her through Leadership Lodi and was immediately in love with her work. You’ve probably seen her creations all over Lodi. Balloons take an event from fun to outstanding, and her work is that special touch at your event that makes guests say, “Wow!” “When we walk in the room, we put the icing on the cake.” says Kathy. “You can’t do that with flowers. I mean you could, but it would be so expensive. We have that ability to do that and that’s what makes it fun.” If you want your event to visually pop, balloons are the way to go (pun intended), and Kathy is the lady for you. I could go on and on about the fun things Kathy creates, but this section is to recognize how much she gives back to Lodi. When you hire Kathy for an event, you have the satisfaction of knowing your money is doing a lot of good. When she can, Kathy supports a lot of local fundraisers. For example, when I was interviewing Kathy for this piece, she had to take a call from a Lodi High FFA teacher. A 15 year old girl in this teacher’s class has ovarian cancer and Kathy was helping them with a fundraiser the following Saturday. That’s the type of thing you can expect your money to be going toward when you work with Kathy. Yes, you’ll get a beautiful balloon masterpiece (I really cannot say enough about the fun her balloon work brings), but you also allow her to support things she’s passionate about. Recently, Kathy was featured in one of those international industry magazines, under “The best of the best” for a fun ice cream inspired number two. From having no balloon knowledge to being featured in an international magazine, it’s a pretty impressive feat. There’s a reason why so many families, local businesses, from F&M to Adventist Health, and big businesses like Amazon and Facebook, love working with Kathy. To wrap our interview up, I asked Kathy what the one thing is she wants people to know about her business. “One day I’m going to retire and I need to find a replacement.” she says “I think this is a valuable product for Lodi. You know, not many towns have a balloon artist. I’m constantly thinking I need to find somebody who’s willing to learn the business and take it forward.” So if you have an event coming up, a birthday party, a fundraiser, a retirement, whatever, call Kathy. You’ll have an event that your friends are talking about and sharing all over social media. You’ll also be able to feel good about your purchase, because you’ll know that money you spent helps Kathy give back to important causes around town. And last, if you love balloons and have a big heart, reach out to Kathy, because she might have a great job for you.